The traditional reaction to being anywhere near a bug is to run far away and abandon any sense of the dignity you've spent your adult life cultivating. But in this world, there are, in fact, people who want to be around insects -- so much so that they'll risk stealing almost the entirety of a museum's collection of the hellions. That's what happened at Philadelphia Insectarium and Butterfly Pavilion, which just opened last year. Around 7,000 creatures were taken in all -- around 80 species, including the likes of rare cockroaches, tarantulas, and millipedes. The haul was reportedly worth up to $40,000. 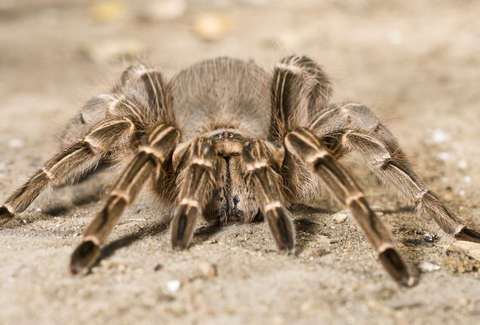 Some are endangered species, and others, like the six-eyed sand spider, have life-threatening venomous bites. "I'm not sure there's ever been a larger live-insect heist," John Cambridge, the museum's owner, told CNN. "Our insurance doesn't cover this. Why would they? This is unprecedented." Apparently, it was an inside job. Security footage shows three employees carrying insects out of the building in boxes over several days. Cambridge explained to CNN that they "know exactly who did this." The thieves left their staff uniforms pinned to the wall with knives and didn't show up to work. Out of the thousands stolen, around a dozen were recovered from one of the suspect's homes, but so far no arrests have been made. "They are very easy to sell. The enthusiast market is quite strong -- exotic pet shows and that kind of thing," Cambridge told CNN. "There's no way they took these to be part of their personal collection." The museum has launched a GoFundMe to start replacing some of what was stolen, and other collectors and institutions have been donating to the museum in the wake of the crime. Currently, only butterfly pavilion and the gift shop remain open, but the museum plans to be entirely reopened by November 3 for its Oddities Expo.